First night at home with your new, CRYING through the night in his crate, puppy? Toss an air mattress on the floor next to the crate and sleep beside your new buddy. They remain in their crate where you want to train them to stay, but they're comforted to have you nearby in this new, strange place. Worked like a charm for both Piper and Murray, and all crying was cured in two nights! Excellent tip Murray!! Thank you so much for that!! 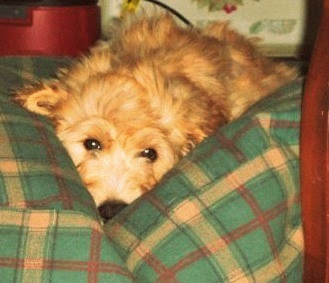 I remember when Chloe was just a teeny little pup...it helped her so much to be right up close! Happy Sunday to you! Great tip. Have a serene and easy Sunday. NO BUDDY Ever wants to be ALONE. Great tip. We've done the same thing with our new puppies!